SAPA president Lina Soo (centre) and others holding a banner with words said by the late Chief Minister Pehin Sri Haji Adenan Satem. 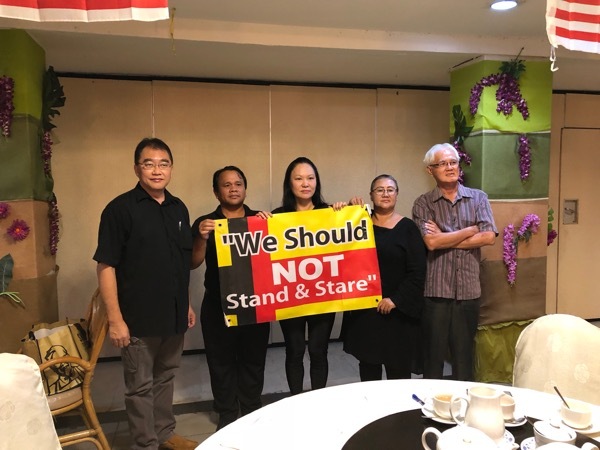 KUCHING: The Sarawak Association for People’s Aspiration (SAPA) will hold a peaceful protest pertaining to the state’s oil and gas rights at Miri Central Park at 8am on 22 September. A vehicle-convoy will then proceed to Petronas at Lutong to deliver a memorandum to Petronas before the participants are dismissed. SAPA president, Lina Soo said that in 2014 a similar protest was held where they submitted a memorandum to Shell and the Sarawak government. “We wanted more jobs, scholarships, and business contracts to be given to the people and companies in Sarawak,” she said during a press conference here yesterday. The theme for the event will be ‘Sarawak Oil, Sarawak Sovereignty’ and those attending are encouraged to dress in black. Those who wish to know more may contact the organising chairman Fong Pau Teck at tel: 012 8832885. SAPA to hold peaceful protest in Miri on 22 Sept 0 out of 5 based on 0 ratings. 0 user reviews.